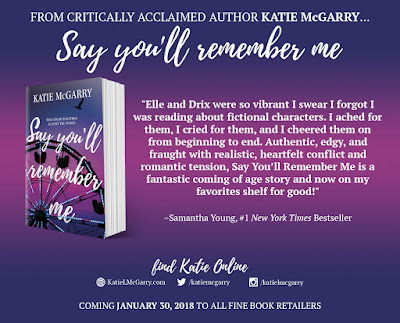 FROM CRITICALLY ACCLAIMED AUTHOR KATIE MCGARRY, COMES SAY YOU’LL REMEMBER ME—A STORY OF TWO PEOPLE FROM DIFFERENT WORLDS PUSHING THEMSELVES, AND EACH OTHER, TO GET WHAT THEY DESERVE! 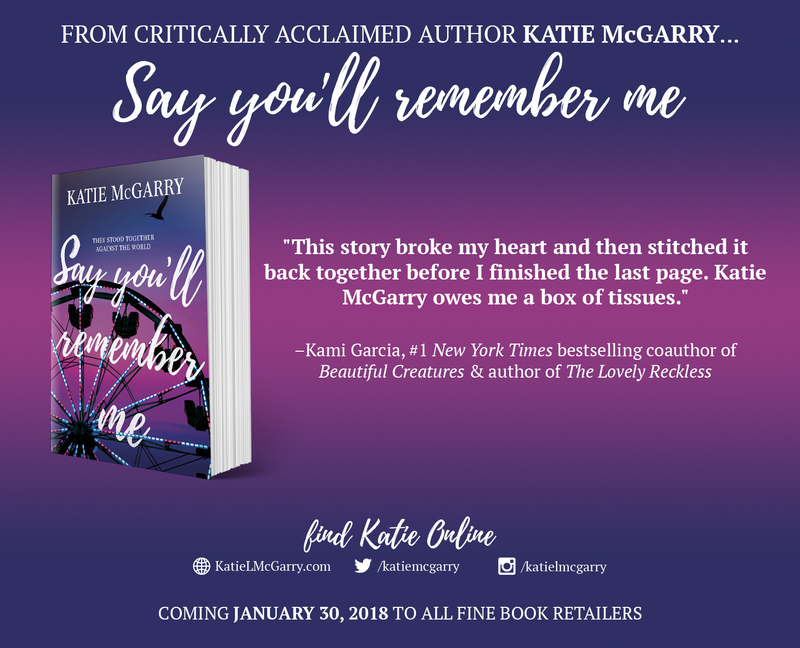 Say You'll Remember Me by Katie McGarry. 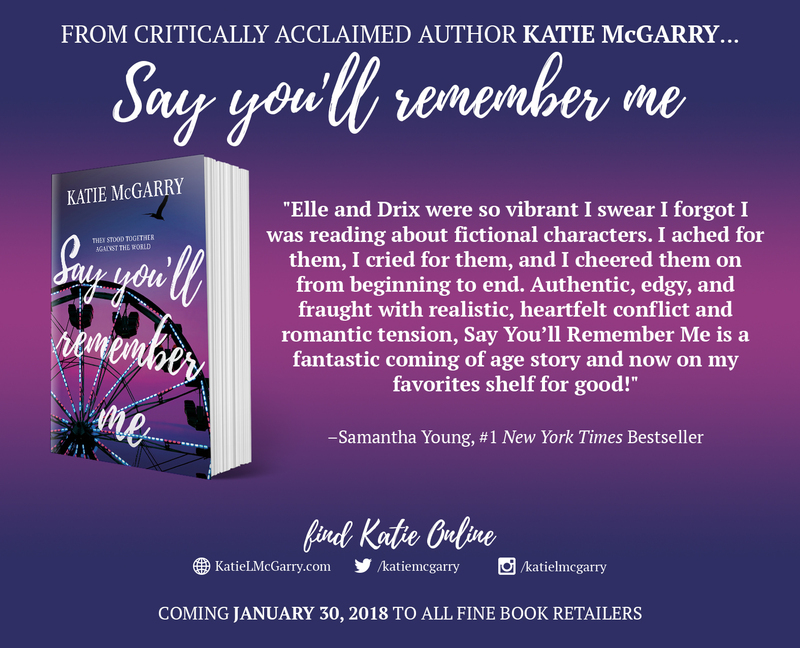 Publication: January 30th 2018 by Harlequin Teen. Getting ready for the New Year? 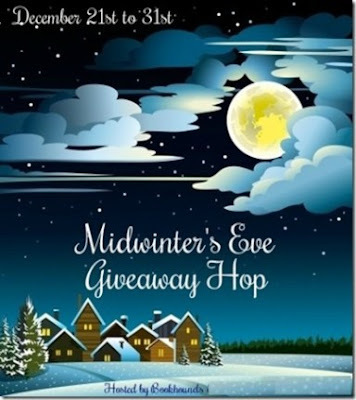 Enter to win here and then go below and check out the other blogs for more fun things to win! Have fun! 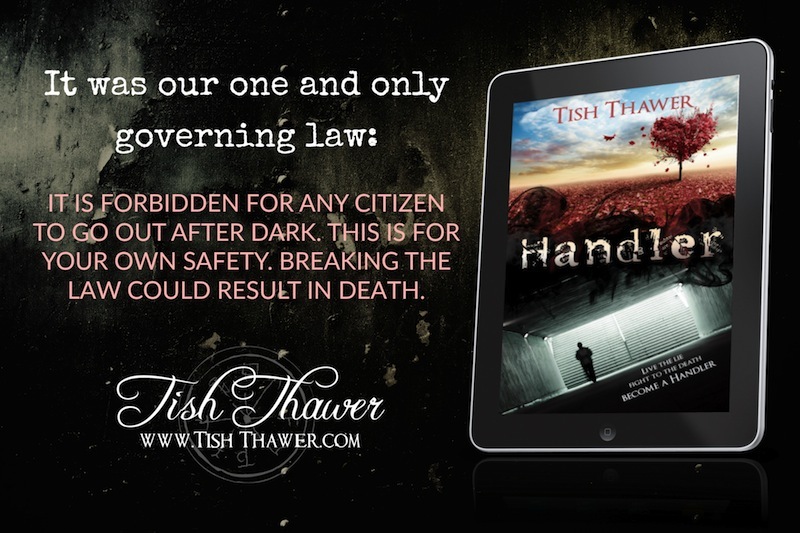 Bestselling and Award Winning Author, Tish Thawer, writes paranormal romances for all ages. From her first paranormal cartoon, Isis, to the Twilight phenomenon, myth, magic, and superpowers have always held a special place in her heart. Tish is known for her detailed world-building and magic-laced stories. 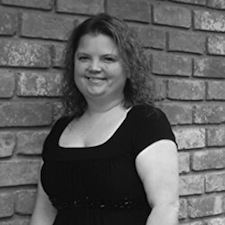 Her work has been compared to Nora Roberts, Sam Cheever, and Charlaine Harris. 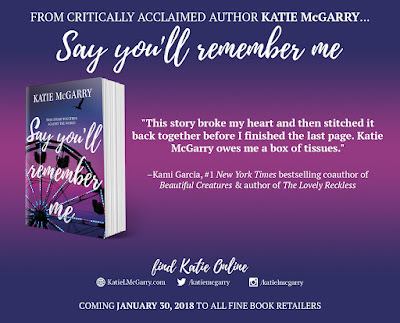 She has received a RONE Award nomination (Reward of Novel Excellence), as well as nominations for Best Cover, Reader’s Choice, and Author of the Year (Fantasy, Dystopian, Mystery). 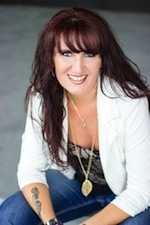 Tish has worked as a computer consultant, photographer, and graphic designer, and is a columnist for Gliterary Girl media and has bylines in RT Magazine and Literary Lunes Magazine. She resides in Arizona with her husband and three wonderful children and is represented by Gandolfo, Helin, and Fountain Literary Management. Breaker James is no longer the boy locked in a prison of his own making. He’s not afraid to leave his house, and he doesn’t need Ash twenty-four hours a day, just to function—just to breathe. Hell, lately it feels like he might not need her much at all anymore. He’s a heart breaker, pure and simple. Turns out love is easy when you’re secluded from the outside world. Maybe Ash is the one who is afraid now…afraid she’s done her job a little too well. 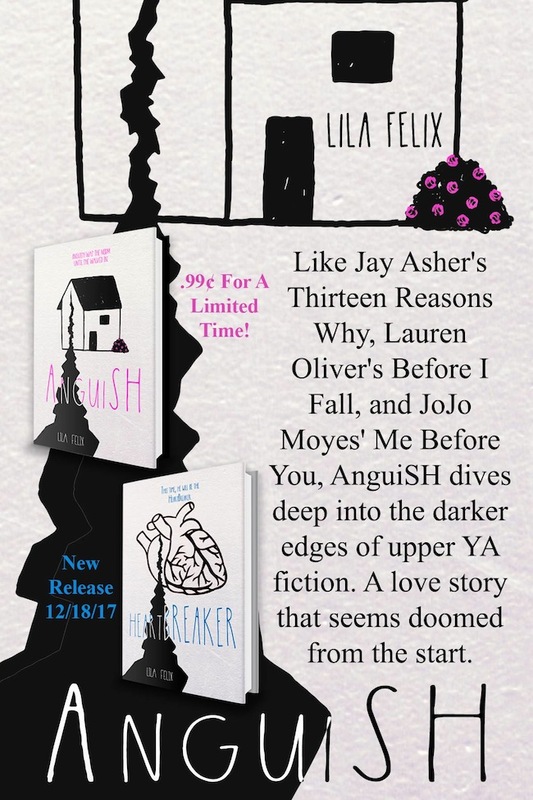 Can she learn how to let Breaker love her, now that he doesn’t need her to be his crutch? 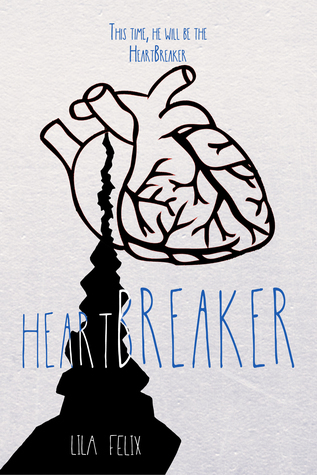 HeartBREAKER is the endearing companion story to Lila Felix’s best-selling AnguiSH novel. 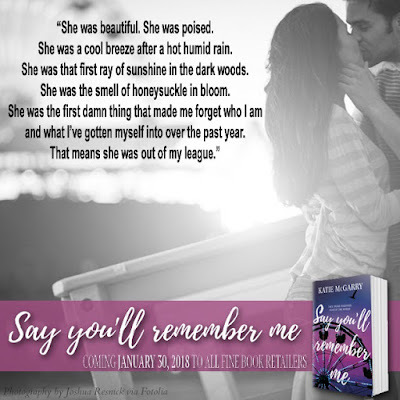 Fall in love with Breaker James all over again! Get book 1 – Anguish – for 99¢ for a limited time! In most instances, I was strong—I could handle anything. But something about Breaker James—well, broke me. I guess that’s the other tough thing about love—it exposes your weaknesses and shines a spotlight on them. Apparently one of my weaknesses was feeling like Breaker didn’t need me anymore. That his need for me in his life had come and gone. Breaker was breaking me again. God, it felt beautiful to be broken. 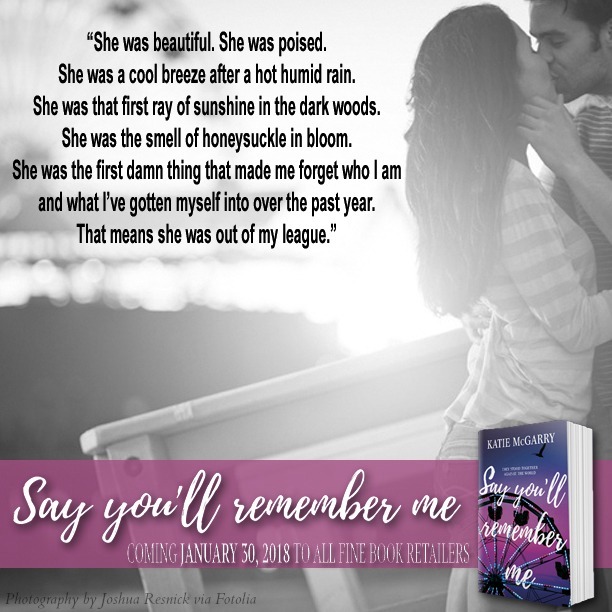 Sassy meets swoon-worthy in this fast-paced contemporary romance. Miriam Salisbury escapes to Oregon to avoid a boyfriend who won't take no for an answer, killing her beloved cat to prove it. 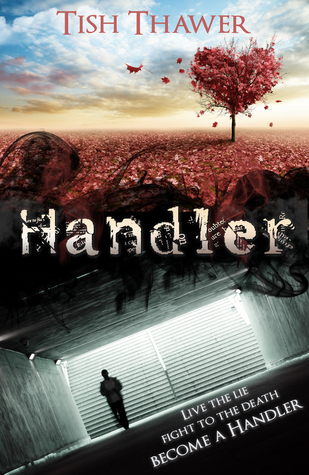 When her father sends Clay Browning to protect her, she's certain he's lost his mind. As far as she's concerned Clay's experience is limited to posing for the camera, charming women, and making fun of her. He's been teasing her since they were children and she's never gotten over the way he threw crawdads at her at church picnics. Clay retired from the military and entered the world of private security. 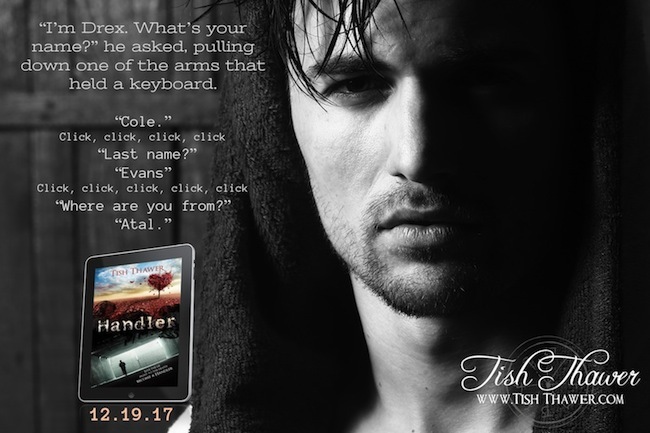 When he gets the call to protect Miriam he's excited to be around his lifelong crush. As expected, he teases her nonstop and the only thing he takes seriously is her security. He knows she'd never give him a chance and he can't help but give her a hard time. After Miriam is dumped in the freezing ocean on a crabbing expedition and Clay saves her from drowning and freezing to death, she takes a second look at her hired gun. But opening up to him is more terrifying than facing her stalker. 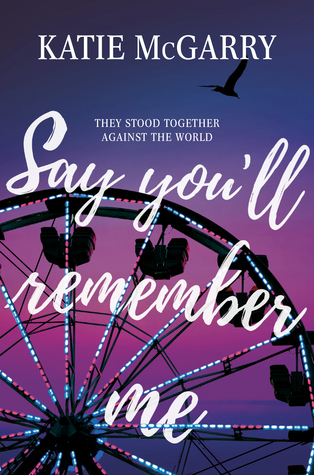 As events escalate to a frenzied climax, Miriam and Clay must put aside past grudges in the hope of finding a lasting love for their future. Miriam closed her eyes as Clay’s arms came around her and held her tight. 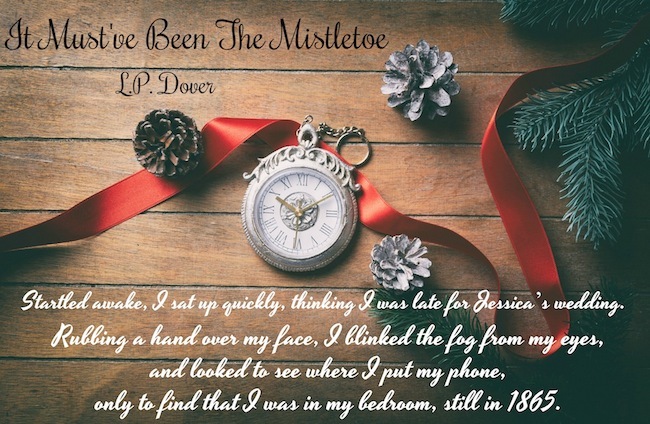 Miriam pushed away from him, stumbling from the realization that he hadn’t changed. Clay was a vicious flirt and never took anything seriously. She shoved at his chest, but he didn’t budge. He was real and he was here, and unfortunately for her unsteady nerves, it didn’t look like he was going away. “What are you doing here?” she demanded. “You do not. 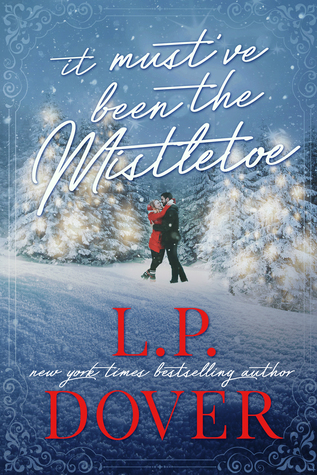 All you’ve ever been good at is spending your billions of dollars and getting women to simper at your feet.” She knew he’d been in the military for four years after high school, but after that, he appeared to be the ultimate player. At least, it looked that way in the online photos she’d seen, when she’d googled him. Okay, it was pathetic that she’d googled him, but he was Clay Browning, a.k.a. Miriam’s dream man. Clay rolled his eyes and folded his arms across his chest. Sheesh. What did he do with biceps that defined? Wrestle bulls? Watch over you? She would not survive with this man in the same town, let alone the same house. Her throat was dry and all those daydreams she used to have about him rotated through her mind. “How did you get in?” she demanded. 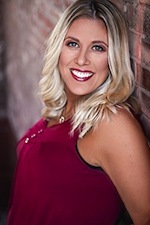 Cami graduated from Utah State University with a degree in Exercise Science. She and her family live in the beautiful Cache Valley of Northern Utah. During the two months of the year it isn't snowing, she enjoys swimming, biking, running, and water-skiing.